The Scottish government has asked for a "full account" of how public money has been spent on the Cairngorm Mountain snowsports centre. Rural Economy Secretary Fergus Ewing said the request had been made to Highlands and Islands Enterprise, which owns the site and its mountain railway. Labour MSP Rhoda Grant raised concerns with Mr Ewing at Holyrood about the running of Cairngorm Mountain. Last year, the private operator of the site went bust. CairnGorm: Where did the money go? Highlands and Islands Enterprise (HIE) was forced to step in and a new company was set up to run the snowsports centre near Aviemore. The funicular railway has also been out of action since October last year. Mr Ewing told Holyrood that the problems affecting the resort were "extremely disappointing". He said: "I have asked Highlands and Islands Enterprise, the accountable agency for Cairngorm Mountain, for a full account of the situation. "I will be meeting with them to establish what more, if anything, can be done. "Snowsports are an important part of our rural economy and through our enterprise agencies we have committed £6m towards infrastructure projects since 2014." He added: "It is important now that we all work together to secure the future of Cairngorm Mountain to benefit the local community." 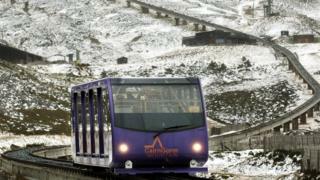 CairnGorm Mountain: Where did the money go?